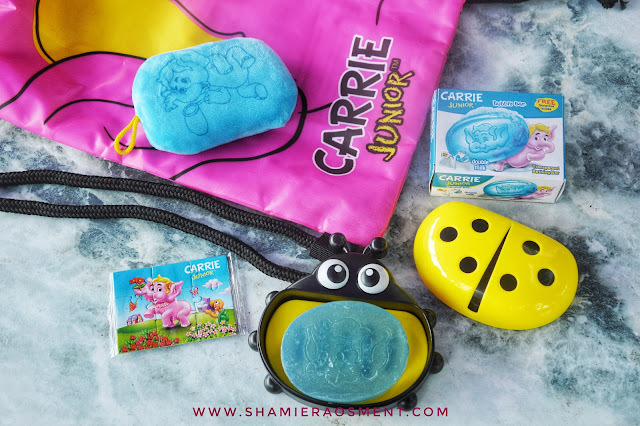 Carrie Junior Bubbly Bar Brings Greater Bath Time Fun. Bath time is more than just a chore; it is the perfect time for precious bonding moments. It is a daily routine that children can benefit most from the extra loving care from parents and caregivers. Bathing helps children relax and the physical touch reassures children in the tender loving care of parents. 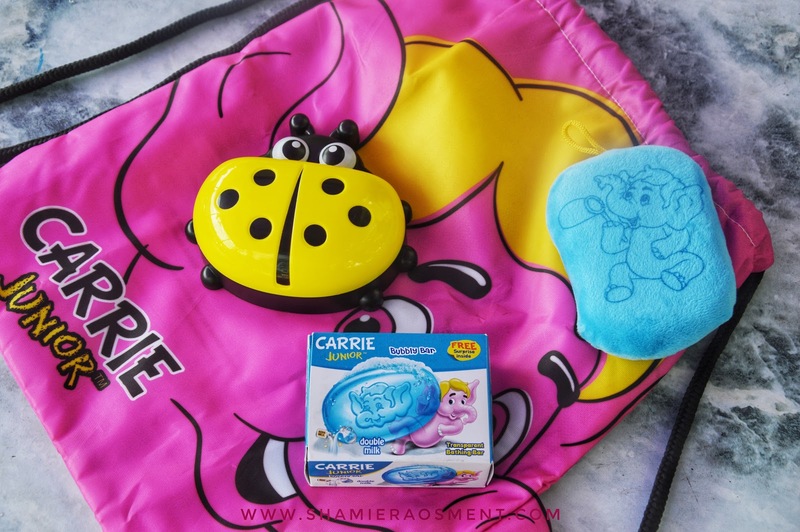 CARRIE JUNIOR the trusted brand in children’s toiletries introduces new bath time fun with the CARRIE JUNIOR Bubbly Bar. The new CARRIE JUNIOR Bubbly Bar will give bath time a whole new dimension of fun in the bathroom. The transparent bathing bar imprinted with a 3D image of Carrie comes in 3 bright and attractive colours of pink, green and blue in accordance with the variants. The new CARRIE JUNIOR Bubbly Bar is a Glycerine soap, making it gentler on skin than most soaps. Glycerine which is derived from natural plant oils makes the soap lower in pH compared to other soaps. It cleanses as it leaves a layer of moisturizing protection behind, helping the skin stay moist. Glycerine in the CARRIE JUNIOR Bubbly Bar also acts as a humectant, drawing moisture to the skin keeping it hydrated all the time. The humectant property does not make skin greasy, but instead it keeps it supple. 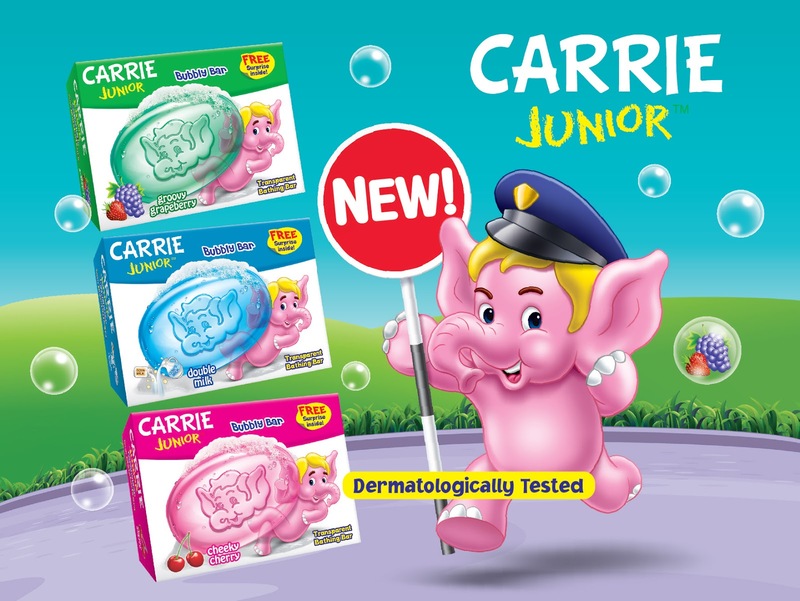 CARRIE JUNIOR Bubbly Bar is dermatologically tested, suitable for all skin types, very mild and gentle on the skin; when diluted with water, it has a soothing effect and is also softening to the skin. Keep your child’s skin hydrated constantly, giving it a moist feeling for up to several hours after bath. Regular use of the CARRIE JUNIOR Bubbly Bar makes skin softer and suppler. The gentle scrubbing effect while using the bathing bar also helps relaxes the body. The CARRIE JUNIOR Bubbly Bar comes in the 3 best-selling, delightfully fruity scents of Groovy Grapeberry, Cheeky Cherry and Double Milk keeps skin fresh and clean. The CARRIE JUNIOR Bubbly Bars are specially formulated with the Carrie Junior signature ingredient Fruito-E, which is a natural combination of fruit extracts. Fruito-E is rich in vitamins and nutrients to help nourish and moisturize skin. 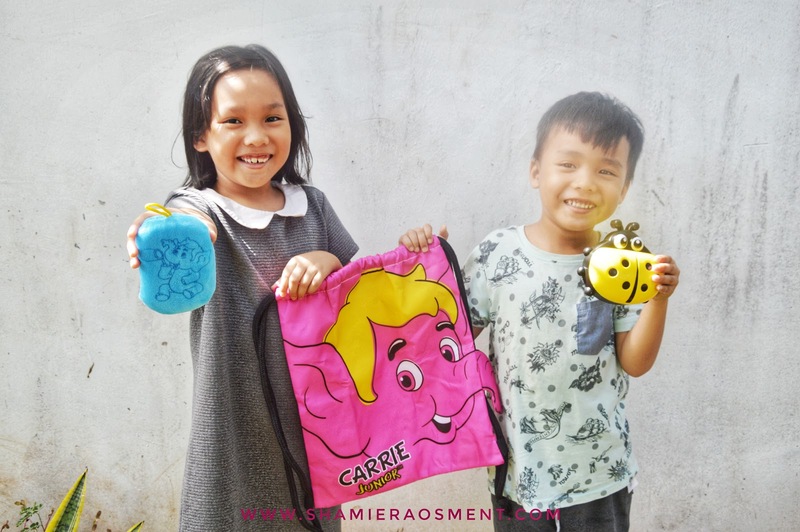 Children can now have more fun in the bathroom as CARRIE JUNIOR Bubbly Bar also comes with a surprise toy in every box. CARRIE JUNIOR Bubbly Bars are available at major retail outlets, supermarkets and hypermarkets nationwide; the 100gm bar soap is priced at RM4.00 (West Malaysia) and RM4.20 (East Malaysia) each. Since 1980 the WIPRO UNZA Group has successfully built a wide portfolio of brands for the personal care and household products markets of Asia. 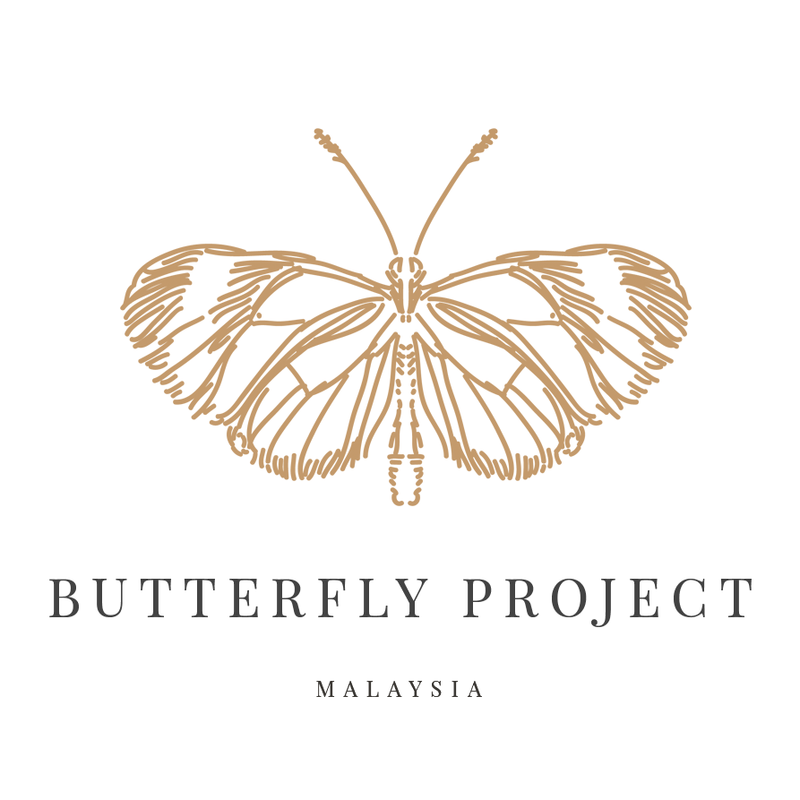 Headquartered in Singapore, the Group manufactures and markets leading brands across 50 territories within South East Asia, Greater China and beyond. WIPRO UNZA has a portfolio of 24 brands. WIPRO UNZA’s leading brands include ENCHANTEUR, SAFI, EVERSOFT, DASHING, CARRIE, ROMANO and AIKEN. Many WIPRO UNZA products enjoy positions of market leadership due to the fact that its brands are specifically designed and created with the Asian consumer in mind. 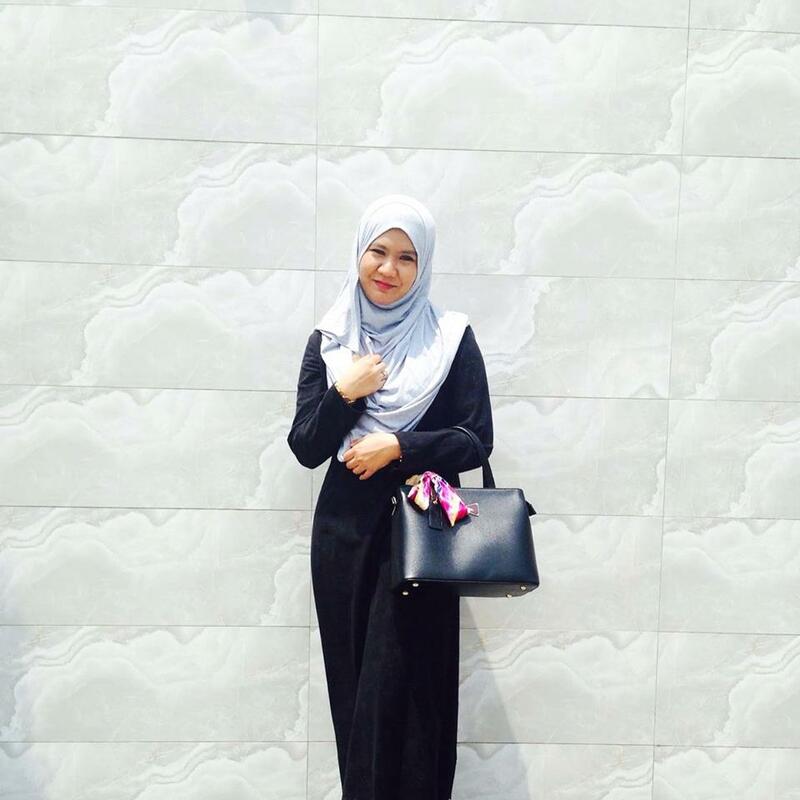 D&V Grand East Cost Mall, Kuantan.